E1PS is glad to bring you a low cost method to test fuel cells and produce professional test data results for under $1,000.00, fuel cell included! See our new Single Slice Fuel Cell Accessory Kits below, now it's easy to learn about fuel cells for around $150.00. The Fuel Cell Test Station comes complete with everything but the hydrogen. There are three meters*, a load box, forced air housing and a fuel cell. 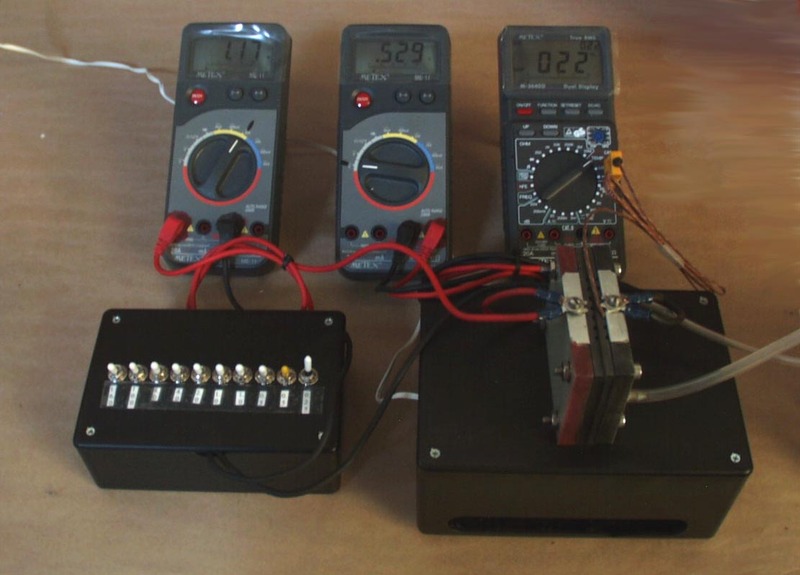 The three digital multimeters will record volts, amps and temperature, and will log all data to a computer with the included RS-232 cables. (Computers not included.) For complete data logging three computers or a single computer with an interface box is required. These meters will run with a 486, so an old surplus machine is all that is needed. The load box will work with a fuel cell up to 3 watts, and the entire system can be easily modified to test larger cells. For larger test applications call for quotes. *These meters are not calibrated, and any readings are for indication only. Every effort is made to verify accurate readings, but there is no guarantee of calibration. E-mail for quotes on systems with calibrated test equipment. Price is 699.95 for Test Station with 1 Watt Fuel Cell. Price is 899.95 for the Test Station with 3 Membrane Fuel Cell (1.5 volts ~ 1 amp). Please e-mail us with any further questions on fuel cell testing and measurement equipment. Please do not send attachments with e-mails without first contacting us. We will not open any unsolicited attachments to e-mails.